Today i was going through the new iSCSI cmdlets in Windows Server 2012, i was pretty amazed to see that we can automate almost all aspects related to iSCSI configurations. 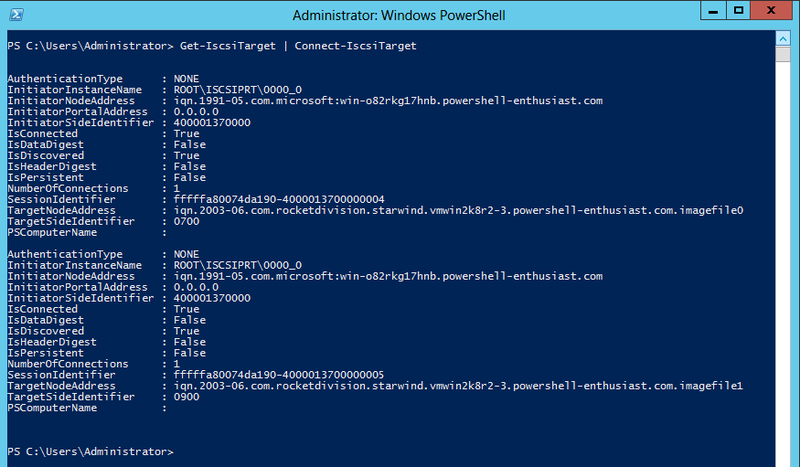 Now i will show you some basic cmdlets which could be used to configure a iSCSITarget on a server. 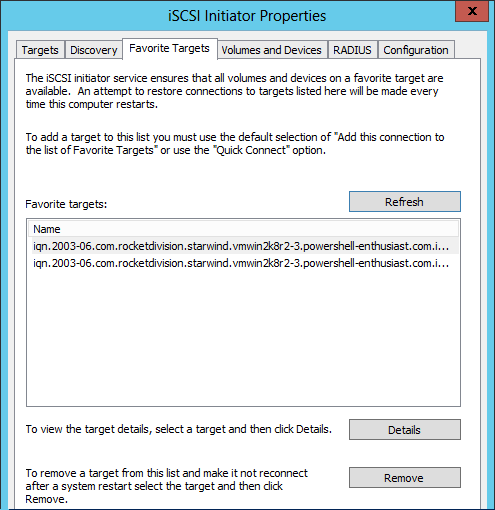 iSCSI Target Server module is loaded by default in Windows Server 2012. 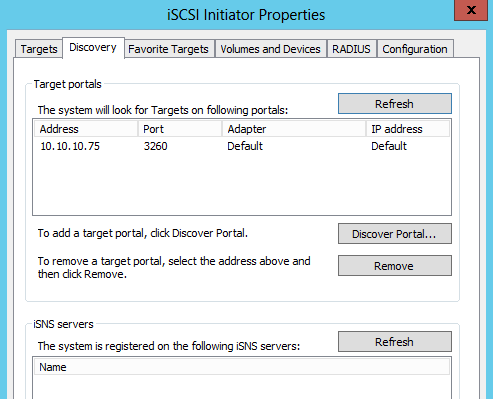 However, the cmdlets cannot be run successfully without the iSCSI Target Server role service installed. For creating this labsetup i used free version of “StarWind Software” to convert a server installed with “Windows Server 2008R2 ” to Storage Server (SAN). It is designed for use with solutions like VMware vSphere, Microsoft Hyper-V and Citrix XenServer. It also supports Microsoft Windows Failover Clustering and a full range of clustered applications e.g. Oracle, Microsoft SQL server, MS Exchange or MS Sharepoint. Here’s the link for the same. It also contains steps in pdf format on how to create shared storage. Ok so now we are set up with a Storage Server in which we have configured two sets of shared storage each of 2GB and 4GB size which are ready to be accessed by other devices. Now in order to access the storage on my Windows Server 2012 box, here are some of steps which i followed. 1) Check Status of iSCSI Service – We should make sure that the iSCSI service is in running state and we should set up its startup type to automatic, if its not none of our cmdlets would work to configure storage. Here’s the view in UI. Now if do a Get-IscsiTarget i can get list of all available targets for that target portal, so as you can see there are two imagefiles which have been created imagefile0 which represents the 2GB storage and imagefile1 which represents 4GB storage. If i want i can connect to individual targets specifying a unique node address too. 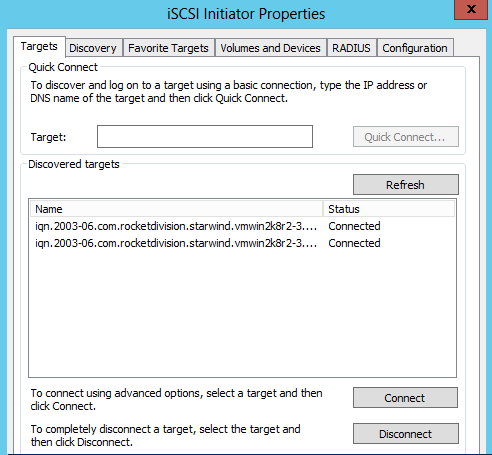 PS C:Windowssystem32> Connect-IscsiTarget -NodeAddress "iqn.2003-06.com.rocketdivision.starwind.vmwin2k8r2-3.powershell-enthusiast.com.imagefile0"
Create new volume – Once the connection is established, the iSCSI virtual disk will be presented to the initiator as a disk. By default, this disk will be offline,then we would create a volume, format the volume and assign with a drive letter so it can be used just like a local hard disk. For these set of steps we would be using Storage Module Cmdlets bundled with Windows Server 2012. Now if i do a Get-Disk cmdlet i can see the list of all disks present, also check if initiator can see the disks. Next i can Make the disks writable using Set-Disk cmdlet and setting -IsReadOnly attribute to 0. Next i can initialize the disk with partition style as MBR using Initialize-Disk cmdlet and setting -PartitionStyle attribute to MBR. Next i create a partition and format it using Format-Volume cmdlet. Next i will assign a drive letter for both the drives using Add-PartitionAccesspath cmdlet..
Next if i check my diskmgmt console i can see that all target disks have been configured. Depending on requirement we can combine all these steps into a PowerShell Workflow and make them run in parallel on a set of servers. Thanx Your post help me to get information & also for fresher who is new in this industy, get knowledge from your blog. 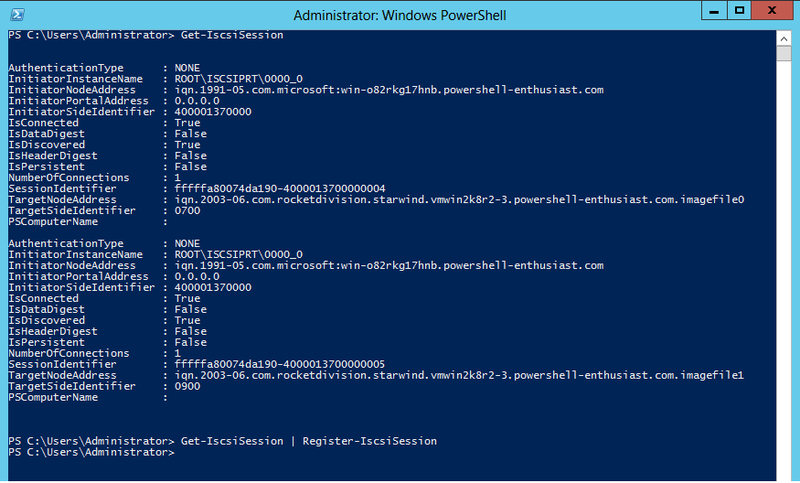 Is it possible to create target and add device in starwid using powershell commands? Thank you very much for this website. It would be very useful if your scripts would just have the commands – it obvious that these lines are script lines. 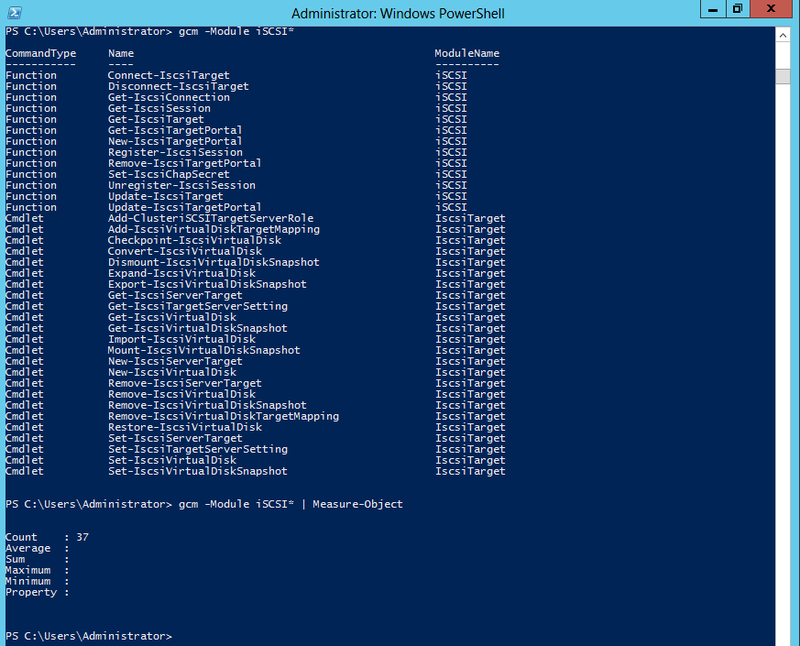 Cleanup VMs in vCenter using PowerCLI.